For courses in juvenile delinquency. 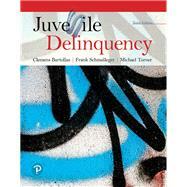 Juvenile Delinquency explores delinquency, including its causes, consequences, and treatments. Unified by a theme of prevention, it analyzes what can be done about delinquent behavior. The text draws on real-life scenarios, statistics, and evidence-based findings to illuminate core influences on delinquency, including gangs, race, gender, and socioeconomic status. The 10th edition has been substantially updated, such as with new information on delinquency over the life course and the most recent studies and statistics relevant to the study of juvenile justice. Clemens Bartollas, Ph.D., is Professor of Sociology at the University of Northern Iowa. He holds a B.A. from Davis and Elkins College, a B.D. from Princeton Theological Seminary, an S.T.M. from San Francisco Theological Seminary, and a Ph.D. in sociology, with a special emphasis in criminology, from The Ohio State University. Dr. Bartollas taught at Pembroke State University from 1973 to 1975, at Sangamon State University from 1975 to 1980, and at the University of Northern Iowa from 1981 to the present. He has received a number of honors at the University of Northern Iowa, including Distinguished Scholar, the Donald McKay Research Award, and the Regents’ Award for Faculty Excellence. Dr. Bartollas, like his coauthor, is also the author of numerous articles and more than 40 books, including previous editions of Juvenile Delinquency (Prentice Hall, 2014), Juvenile Justice in America (with Stuart J. Miller; Prentice Hall, 2014), and Women and the Criminal Justice System (with Katherine Stuart van Wormer; Prentice Hall, 2014). Frank Schmalleger, Ph.D., is Distinguished Professor Emeritus at the University of North Carolina at Pembroke. He holds an undergraduate degree from the University of Notre Dame and both master’s and doctoral degrees, with special emphasis in sociology, from The Ohio State University. From 1976 to 1994, he taught criminology and criminal justice courses at the University of North Carolina at Pembroke; for the last 16 of those years, he chaired the university’s Department of Sociology, Social Work, and Criminal Justice. The university named him Distinguished Professor in 1991. Dr. Schmalleger has taught in the online graduate program of the New School for Social Research, helping to build the world’s first electronic classrooms in support of distance learning through computer telecommunications. As an adjunct professor with Webster University in St. Louis, Missouri, Dr. Schmalleger helped develop the university’s graduate programs in administration of justice as well as security administration and loss prevention, and taught courses in those curricula for more than a decade. A strong advocate of Web-based instruction, Dr. Schmalleger is also the creator of numerous award-winning websites. Dr. Schmalleger is the author of numerous articles and more than 40 books, including the widely used Criminal Justice Today (Pearson, 2019), Criminal Justice: A Brief Introduction (Pearson, 2018), Criminology Today (Pearson, 2019), Criminology: A Brief Introduction (Pearson, 2018), Criminal Law Today (Pearson, 2014), and Corrections in the Twenty-First Century (with John Smykla; McGraw-Hill, 2017). He is also founding editor of the journal Criminal Justice Studies and has served as imprint adviser for Greenwood Publishing Group’s criminal justice reference series. Visit the author’s website at www.schmalleger.com. Michael G. Turner, Ph.D. is a Professor and Chair of the Department of Criminal Justice and Criminology at the University of North Carolina at Charlotte. He holds a B.S. in Criminal Justice from Bowling Green State University and a M.S. and Ph.D. from the University of Cincinnati. His research areas center around empirically testing criminological theories, understanding the nature and extent of victimization, and estimating measurement issues related to delinquency and crime. Dr. Turner has published over 40 peer-reviewed journal articles in areas such as criminological theory, victimization, and crime measurement. He has secured over a million dollars in extramural funding to support his research and, along with his colleagues, he has published a monograph on The Sexual Victimization of College Women.